Turkish yard Numarine has taken an order for hull number three of its 32.5 metre Numarine 32XP series, it has emerged. The client is described as an “experienced Mediterranean owner” and the yard has agreed to an August 2018 delivery date, working to RINA standards. Styled inside and out by Can Yalman, this steel-hulled displacement yacht features naval architecture by Umberto Tagliavini and a total interior volume of just under 300GT. Al fresco relaxation options are plentiful with 330 square metres of deck space, including a vast upper deck aft, which measures 129 square metres and boasts a large couch, bimini and extensive sunpad areas. 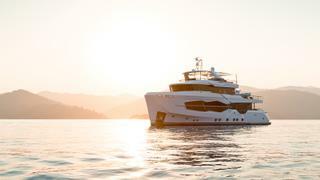 Meanwhile, the superyacht sundeck offers outdoor dining for up to 12 people. Other key features include a superyacht gym on the main deck. Accommodation is for up to 12 guests split between six cabins, including a full-beam master cabin located on the main deck. What’s more, three crew cabins on the lower deck allow for a staff of up to five people. Power comes from a pair of 715hp Caterpillar C18 ACERT engines for a top speed of 14 knots and a transatlantic cruising range of 4,000 nautical miles when trimmed back to nine knots, drawing on a total fuel capacity of 29,000 litres. This sale comes four months after the first hull in the Numarine 32XP series Marla (pictured above) was delivered. Other superyacht projects currently under development at the Turkish yard include the Numarine 26XP series, with the first two hulls also due to launch next year.